All vacuums are created equal. What?!! How can this be? Some vacuums cost $49, and other vacuums cost over $2500. How can you tell the difference between a quality vacuum cleaner and a lemon? 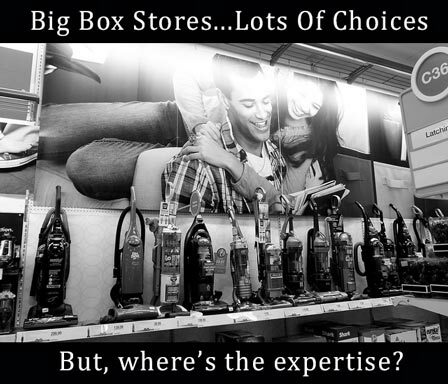 Deciding what vacuum you need to buy can be a real pain in the neck. Let me help you! What size vacuum cleaner do you really need? What type of vacuum cleaner are you looking for? What do you want your vacuum cleaner to do? What is your estimated budget versus actual cost for purchasing a quality vacuum cleaner? What brands of vacuum cleaners frequently require repairs? What vacuum cleaner brands come with warranties? How much do vacuum cleaner manufacturer warranties actually cover? You shop online for a vacuum and you will have to rely on limited product descriptions and customer reviews. Product Descriptions may give you very little information about whether or not a particular vacuum cleaner will actually meet your needs. Customer reviews can be extremely helpful, with one exception some reviews can be wholly misinformed and subjective to that person’s particular experience. Dissatisfied customers may or may not have been informed about the particular maintenance needs of a vacuum cleaner before purchasing. When the vacuum breaks they assume that it’s because that particular brand is just a bad vacuum manufacturer. It’s not the customers fault, they just weren’t educated properly. Department stores and big name chain stores (we don’t want to directly incriminate a name…but you may have some ideas) will generally tell you that the most expensive vacuum cleaner is the best purchase. That’s not always true. Most of these big brand companies or big box stores as they are sometimes called, are after the bottom line. Most employees or salespeople at department stores don’t know the specifics of vacuum cleaner maintenance, or what each vacuum brand specializes in. They are trying to make a sale happen, because that is their job. It’s not their fault, they just have too much other stuff they have to sell to gain true expertise and provide reliable information about purchasing the right vacuum cleaner. Once you buy a vacuum cleaner, you are mostly out of their hands. If you need to come back with a complaint, you will most likely be sent through a long process of having to go back and forth between the big store and the manufacturer in order to be compensated for your trouble. And, if they do compensate you for the bad purchase, you still haven’t solved the issue that occurred in the first place. That’s a lot of wasted time and effort. 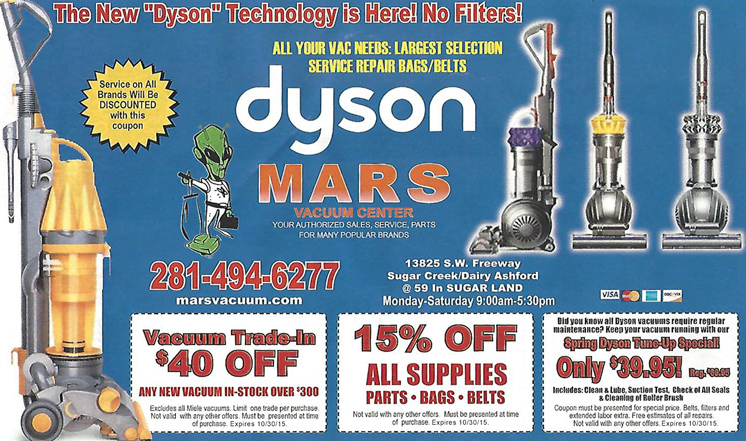 You can avoid the headaches by shopping for your vacuum cleaner and other home cleaning needs at a local store like Mars Discount Vacuum. For instance, did you know one of the most important factors in your decision to purchase a vacuum cleaner should be air flow not suction? When the big name stores and online retailers advertise their vacuums they say that “Their vacuum cleaners never lose suction!” Which would make you think suction is the most important thing to remember, but it is not it’s AIR FLOW. Remember: Air flow is very important when choosing which vacuum to purchase, not suction. Air flow in vacuum cleaners varies widely from brand to brand and model to model. Different vacuum cleaners are required for different types of carpeting, tile, and wood floors. Any legitimate vacuum dealer should guide you through this process and make sure you are getting the vacuum cleaner that fits your needs. We are not just trying to make a sale happen, we like building relationships with our customers. We help you stay informed on what you need to buy, not what we want to sell you. We want you to be satisfied with your purchase the first time, so you will come back and see us with any of your future vacuum cleaner or home cleaning needs.